2016-2017 Donghia Designer-in-Residence, TATIANA BILBAO, launched her residency with a lecture at the Museum of Contemporary Art, Los Angeles, on March 15, 2017.
middle left, l-r: Consul General of Mexico in Los Angeles Carlos García de Alba and Cultural Attaché and Consul of Mexico in Los Angeles Andres Webster Henestrosa at the lecture. The Consul General participated in the introduction to the lecture and welcomed Tatiana to the 2017 Año de México en Los Angeles. Architecture/Landscape/Interiors (A/L/I) at Otis College of Art and Design offers a synthetic curriculum of the spatial design fields. For information about the department call 310.665.6867, email ArchitectureLandscapeInteriors@otis.edu, or visit http://www.otis.edu/ali. 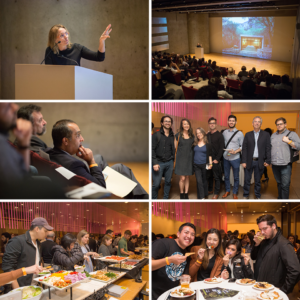 SEE and LIKE Architecture/Landscape/Interiors at Otis College of Art and Design on Facebook!